This book examines anti-imperialist thought in European philosophy. 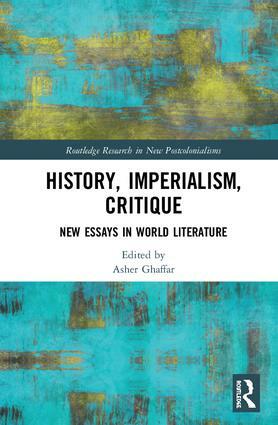 It features an international group of both emerging and established scholars who directly respond to Timothy Brennan’s far-reaching call to rethink intellectual histories, literary histories, and the reading habits of postcolonialism, in relation to the anti-imperialist tradition of critique. Each contributor rethinks postcolonial and world literature, Continental thought, and intellectual history in relation to anti-imperialist histories and traditions of critique, through geographically diverse analysis. This book provides a forum for the next generation of scholars to draw on and engage with the marginal yet influential work of the first generation of dissidents within postcolonial studies. It will appeal to researchers and students in the field of postcolonial studies, world literature, geography, and Continental thought. Asher Ghaffar is a PhD candidate in Social and Political Thought at York University, Canada. His research monograph, Muslims in World Literature: Political Philosophy and Continental Thought,is forthcoming with Routledge in 2019. His most recent essay on Zulfikar Ghose and Hanif Kureishi will appear in The Routledge Companion to Pakistani Anglophone Writing, edited by Aroosa Kanwal and Saiyma Aslam. He is also working on a second poetry collection.